Shocker of a night, though most everyone else declared they had slept ok. Though there were a few night walkers around the deck, I wasn’t one of them! We rocked and rolled and lapped as we sat into the tide rather than the wind and breeze blew all night, creating a short chop that got Pilgrim right under her duck tail. BANG! Shake, ping, bang…….most unpleasant. Everyone else was up around 7 I didn’t mange to surface until 8 as we thought about weighing anchor. The morning was a beautiful one, light breeze, the reef covered and the island looking serene. 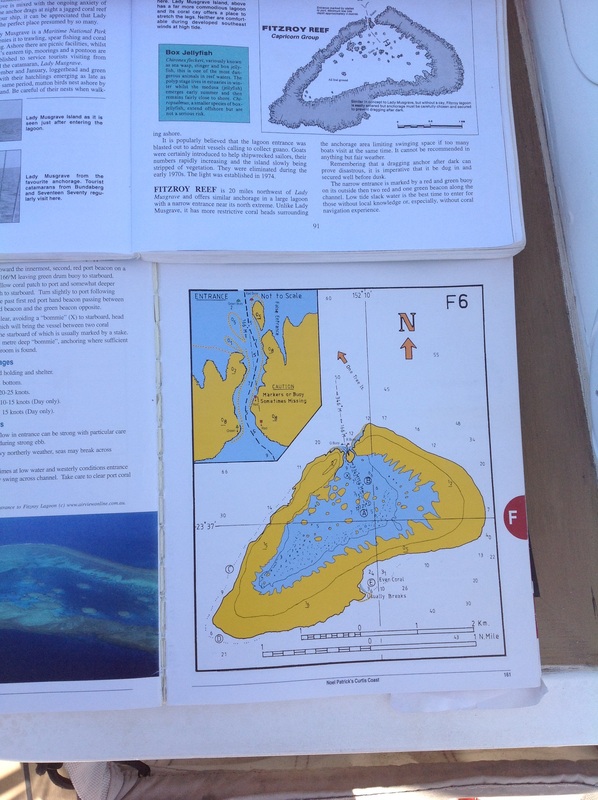 We decided to make for Fitzroy, as the forecast seemed benign, with a 10 knot NE again forecast, with a small swell. The breeze got lighter as we headed south and soon we could see Heron Island on the bow. As we got closer, the reefs at Heron and Wistari started to show a translucent green on the horizon. We made the passage at about 11, and it took about 20 minutes from end to end, with the amazing colours of the water on either side, though the passage is very wide. After this, I decided to head down for a snooze, and was called as we arrived at Fitzroy. The entry to the lagoon is very narrow and coral sided with a very big tide running out. Paul asked for us to be spread out around the boat, me on the bow with arms out, thumbs up if ok, pointing down on the side to avoid. Clare and Pete at the rig, one on either side, repeating my signal. There were standing waves through the channel so it was going to be tricky, especially as a whale started breaching big time, close by, and we tried not to be distracted by the best view of a whale so far this trip! Paul lined up the port and starboard buoys outside the entrance and then pointed straight in and we were off. It was about 12:30, so the sun was in a great position to light up the coral, and though it was deep you could see clearly. We motored hard against the roiling tidal flow, and no one talked about the light patch at the head of the channel that looked like it was very shallow. We made it through to the light patch and as we climbed the last standing wave of outflow, we realised the light patch was reflected sky, and the channel entry was deep. Suddenly we were in turquoise waters, around 10 meters deep, but you could see the grains of sand on the bottom. We negotiated around a few bommies and found ourselves in a good, clear sand patch for anchoring and let go. You could see the anchor clearly on the bottom, so it was easy to make sure it was well dug in. The boys then headed out to check it and lay a small marker buoy above the anchor. 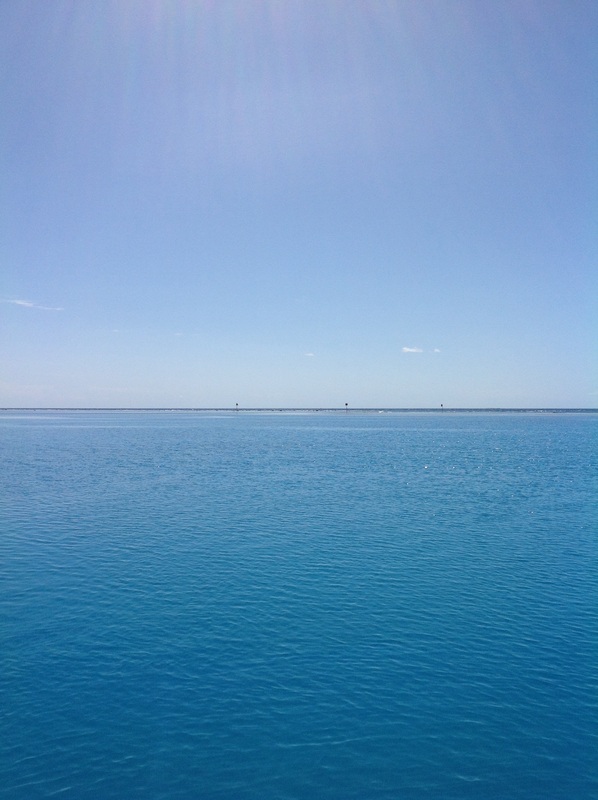 Clare and I threw together linguini, with clams, squid and mackerel in garlic butter with parsley as lunch, and we sat and admired the astonishing colour of the lagoon and the peace of flat still water, when it had been a little lumpy at sea. We were all thinking about the fabulous afternoon of snorkelling ahead. Paul and Peter went to check out a buoy that looked like a mooring buoy whilst Clare and I got our snorkelling gear together. As we sat in budgie, Paul decided it was a great idea to check out the snorkelling in the entrance channel. The tide as still running strong, and we watched a big power boat make the entry at about 20 knots, slowing just as they made it into the lagoon. Clearly the way to do it if you know it well. As the power boat headed off to moor, Paul jumped in, leaving the three of us in the budgie. Then Pete decided he also wanted to go in, leaving Clare on the dinghy with me. We watched Paul flying down the channel and then saw him wave, and went to go collect him, but as we hit the tide we realised it wasn’t going to be an easy pick up. Clare got nervous as you needed a lot of power to steer in the tidal flow, and asked me to take over. I am not much better on a dinghy, as I have only just got used to our little outboard, but I managed to go past Paul and execute a turn back into the current. Paul’s wanted me to get close to him, as he had found a ledge out of the strongest flow, so I tried to direct the dinghy that way, but it was very hard to hold it on course without a lot of power. With a lot of power, I found it hard to work out which was power on and off when turning the throttle, and this was our undoing. As Paul called me close to him, he intended to hang on the outside it the dingy to get us out of the flow. However, as I got close, the stream was running fast and I got nervous about missing him and us all ending up at sea. I am still not entirely sure what happened, but I remember Paul grabbing on, and then we were circling at speed, with the sound of the engine grating against coral. I looked around and saw Paul face down, but he spun, calling his knee was hurt, and that we should get Pete on board quickly then come back for him. I don’t recall how we got Pete on board, but somehow we did, and he took over the engine. Then we managed to get Paul on board and again, I don’t recall how, but we saw that he had a profusely bleeding cut to his forearm and a horribly deep cut to his knee. He seemed ok and said the knee was from Coral, but it looked like an outboard propeller to me. We got back to Pilgrim who was fortunately close to us, and managed to all get aboard. Clare pulled out the med kits and we helped Paul to flush and dress the two wounds. They both looked clean and coral free, which convinced me it had been the prop, but Paul insisted it was coral. However, we soon had him cleaned up and the both wounds dressed, and immediately we packed up to head for Gladstone while we still had enough sunlight and water to exit the reef. Same procedure on exit, with placing of crew and signalling. A little less easy to see as the sun was lower in the sky and in front of us, but we managed to exit the lagoon and point for Gladstone. We made the decision that Paul needed immediate treatment because of the depth of the cut on the knee, so started the radio procedure with a pan pan call. We were immediately answered by Hooked on Two, who picked up our call and assisted us to rely to a VMR shore base. I think it was Gladstone we got first, who told us to head for Round Head Creek and they would get paramedics there to meet us. They did offer a helicopter evacuation but we didn’t feel it was that critical. Then Hooked on Two continued to assist, by heading to our location, transferring Paul so they could get him to shore more quickly. The transfer went very well indeed, with a very skilled skipper putting Hooked on Two gently alongside Pilgrim in a way that enabled Paul to simply step across.they headed off for Round Hill, leaving Pete, Clare and myself in somewhat of shock, to keep making our way ashore. We had booked into Gladstone marina, but after some discussion and a couple of chats with Hooked on Two, we decided instead to make for Bundaberg. Whilst Gladstone was just 40 or so miles away, we would be arriving after dark, and Paul may end up in Bundaberg hospital anyway. Wherever he ended up, Bundaberg was a better location for us, for a number of reasons. 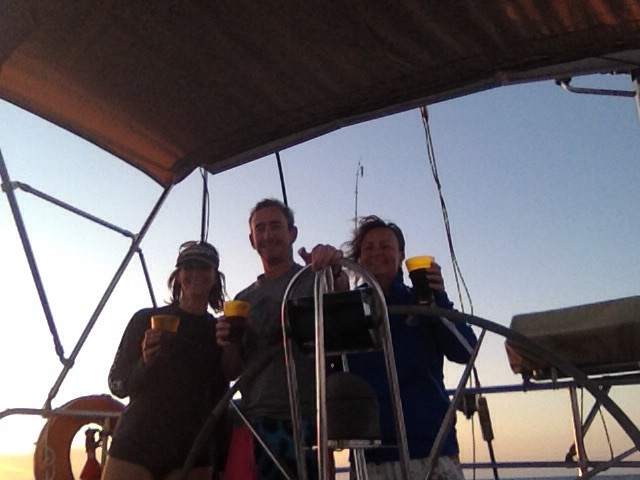 It was around about 70 miles from our decision point, which meant sailing through the night. It was the most likely place that Paul would end up, as well as closer to our ultimate destination of the inside passage for Fraser Island. Three up, we could do 2 hours on watch each, which meant a four hour rest, and we would arrive at Bundy in the early morning, so daylight and making tide to get in. We received periodic updates from Paul, who seemed in good spirits, though concerned for Pilgrim. He did end up heading to Bundaberg hospital, so we were pleased we had made that decision. 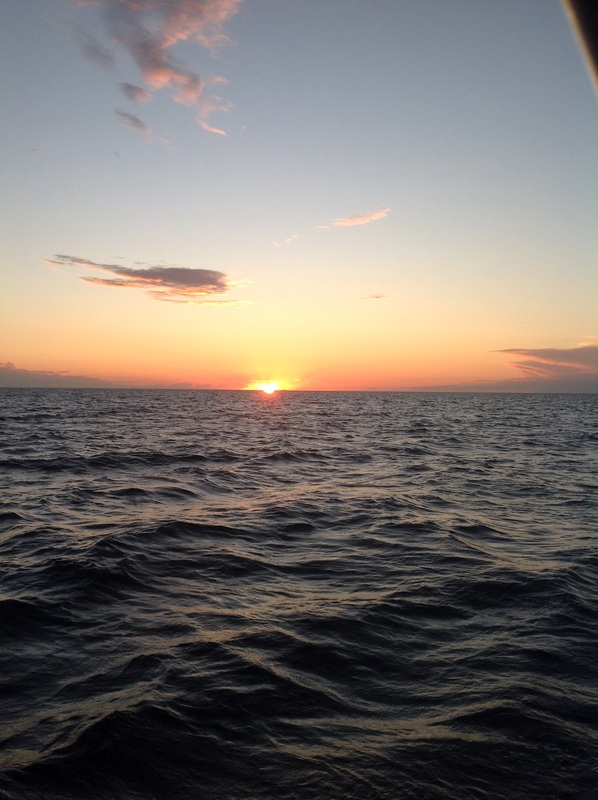 It was generally a pleasant night, though we had breeze up to 17 knots for a short period at my 9pm to 11pm watch, though by the time I called Clare up for her watch it was back to 10 knots. When I got up at 3am, it was blowing around 10 knots from starboard slightly ahead of the beam, so we had the genny out. By the time I was going off watch around 5:30, it was about 5 knots and I furled the genny, and checked with Clare as I could see channel markers much earlier than expected. Clare took over and I headed down to close my eyes, and was surprised to be woken at the Marina. Must have gone out like a light! We hung off the dock for about half an hour until there was a bit more water under us – we preferred 4 meters rather than 3, without Paul aboard! Finally though we were alongside, after good parking by Pete, ably backed up by Clare and I. The marina folk were very accommodating and friendly and after they assisted us to move into a better spot, we had bacon and eggs for breakfast, cleaned up, got budgie aboard, then got ourselves sorted for a shower. Clare fielded a number of calls, including Paul organising business from hospital, but as I write, we are hoping that Paul is finally in surgery, and we will see him later this afternoon, when we borrow the marina car.